As of version 1.7.6, you can select to allow your users to attach a message to the transfer. This message is then shown in the recipient’s points history. 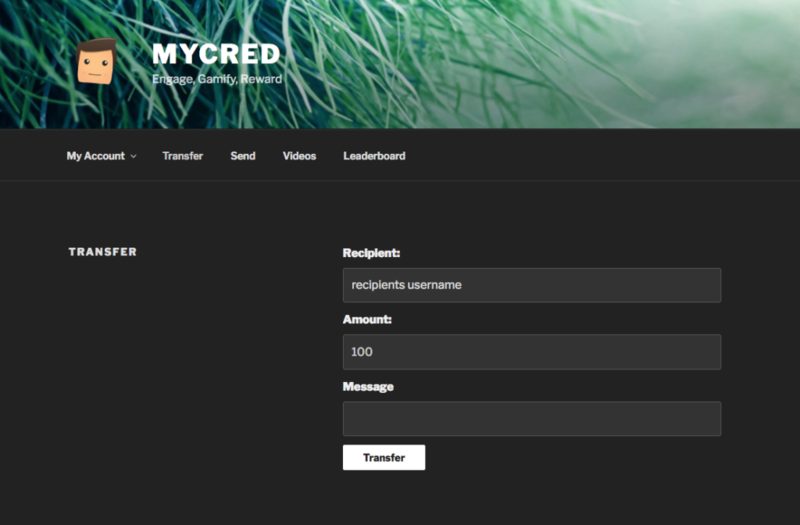 Before version 1.7.6, the transfer message feature was available as a customization on the myCRED.me website. If you have been using this custom code to add this feature, you must make sure you remove the customization once you update to 1.7.6 or higher. If enabled, a message field is added to the mycred_transfer shortcode. Users can select to type in a message for the recipient however this is not mandatory for the transfer to be sent! Messages must be plain text and a maximum character limit is enforced. The message is sanitized and stripped of all HTML content. The message is saved in the transfer log entry and can be accessed via the %transfer_message% template tag in log entries. Example of how the transfer shortcode form is rendered. A minimum of 100 points needs to be transferred along with an optional message.